There’s little doubt that the world where everyone works in one office building from a 9-5 is truly over. Thanks to robust remote work tools and widespread cheap broadband, we can now source our employees from anywhere in the world you get laptops and WiFi. It all sounds great in theory, but in practice, a virtual assistant is still a real person and managing them so that you get your money’s worth is not something you should take for granted. Luckily, there are a few principles you can follow to ease the management load and keep both you and your assistant happy and productive. These are some smart ways you can increase the productivity of your VA.
Few people can do a good job without any sort of structure or guidance. It may take some upfront effort, but take the time to establish procedures and processes that you VA can follow. A virtual assistant should never have to wonder about what they need to do. Provide a way to report what they’ve done on a regular basis as part of their job. This is NOT the same thing as micromanagement. Once you’ve built the structure for your VA, it should only be necessary to check up periodically. Just because your human resource is far away, doesn’t mean you can skimp out on human resources management. You need to use the right tools to track your VA’s hours, manage sick leave or vacation and all the other little details of employing someone. Luckily, internet technology has not just given us remote workers, but also great management tools for those workers. For example, advancesystemsinc.com is basically a complete offering where you can all the management services you’ll ever need. Team building is not just something that you need to do with people you physically work with. Try to include your VA as a colleague. Make them feel like a part of your organization and they’ll protect your business interests on your behalf. It also helps to have non-business chats as well. Get to know each other in a way that would be appropriate for two co-workers. It’s difficult to work productively for someone who is a stranger. On top of this, if your VA knows you well then they can be a better assistant and anticipate your needs and desires. It’s a win-win strategy! A few things destroy a VA’s ability to work than a boss who doesn’t communicate well. When you give instructions, make sure that your VA understands and that you are being crystal-clear. Make sure that you also create dedicated and reliable communication channels. Your virtual assistant should always be able to reach you and you should never ignore their messages indefinitely. If your VA is waiting for something from you, it means you’re also paying for their idle time. In the modern age of Skype and instant messaging there is never an excuse for stonewalling your VA. That being said, you should also clearly define the boundaries of work time and personal time. For both yourself and your VA. Unless it’s a bona fide emergency there should be no communication during those times. When your virtual assistant saves your skin or shows initiative, don’t pretend it’s business as usual. Let them know you’ve noticed their ambition or professionalism. Sometimes a little reward here and there can also do wonders for the productivity of a virtual assistant. It’s no wonder so many companies are now hiring VAs, they can be a great investment with invaluable returns. A good VA will let you concentrate on what’s important: running your business. If you put in the time to lay a good foundation and build your professional relationship there will never be an unproductive day in your future. Charles Dearing is a blogger and business consultant who loves sharing his experiences and insights on popular business and career blogs. When he is not writing he loves traveling and spends his time with his family. I’ve just gone through this article. It is so helpful. 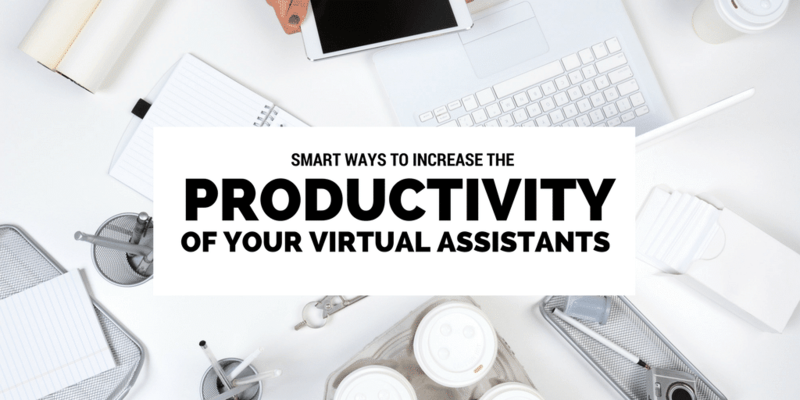 I found here some really good tips to increase the productivity of virtual assistants. I hope this will be more helpful for small businesses and mompreneurs working from home. Great piece of work. Thanks!